Looking for a simple way to help reduce stress, anxiety, and depression, and maybe even improve your memory? Take a walk in the woods. "Many men are at higher risk for mood disorders as they age, from dealing with sudden life changes like health issues, the loss of loved ones, and even the new world of retirement," says Dr. Jason Strauss, director of geriatric psychiatry at Harvard-affiliated Cambridge Health Alliance. "They may not want to turn to medication or therapy for help, and for many, interacting with nature is one of the best self-improvement tools they can use." Research in a growing scientific field called ecotherapy has shown a strong connection between time spent in nature and reduced stress, anxiety, and depression. It's not clear exactly why outdoor excursions have such a positive mental effect. Yet, in a 2015 study, researchers compared the brain activity of healthy people after they walked for 90 minutes in either a natural setting or an urban one. They found that those who did a nature walk had lower activity in the prefrontal cortex, a brain region that is active during rumination — defined as repetitive thoughts that focus on negative emotions. "When people are depressed or under high levels of stress, this part of the brain malfunctions, and people experience a continuous loop of negative thoughts," says Dr. Strauss. Digging a bit deeper, it appears that interacting with natural spaces offers other therapeutic benefits. For instance, calming nature sounds and even outdoor silence can lower blood pressure and levels of the stress hormone cortisol, which calms the body's fight-or-flight response. The visual aspects of nature can also have a soothing effect, according to Dr. Strauss. "Having something pleasant to focus on like trees and greenery helps distract your mind from negative thinking, so your thoughts become less filled with worry." If you can't make it outside, listening to nature sounds can have a similar effect, suggests a report published online March 27, 2017, by Scientific Reports. Researchers used an MRI scanner to measure brain activity in people as they listened to sounds recorded from either natural or artificial environments. Listening to natural sounds caused the listeners' brain connectivity to reflect an outward-directed focus of attention, a process that occurs during wakeful rest periods like daydreaming. Listening to artificial sounds created an inward-directed focus, which occurs during states of anxiety, post-traumatic stress disorder, and depression. Even looking at pictures of nature settings, your favorite spot, or a place you want to visit can help. How much time with nature is enough? 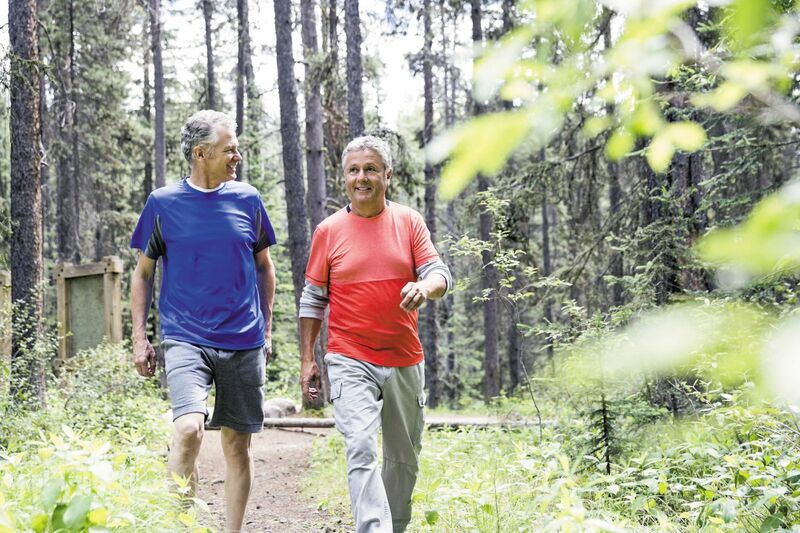 "Anything from 20 to 30 minutes, three days a week, to regular three-day weekends in the woods is helpful," says Dr. Strauss. "The point is to make your interactions a part of your normal lifestyle." Your time with nature could be something as simple as a daily walk in a park or a Saturday afternoon on a local trail. "You can even try to combine your nature outings with your regular exercise by power walking or cycling outdoors," says Dr. Strauss. The type of nature setting doesn't matter, either. "Focus on places you find the most pleasing," says Dr. Strauss. "The goal is to get away from stimulating urban settings and surround yourself with a natural environment." And don't feel you have to go it alone. A 2014 study found that group nature walks were just as effective as solo treks in terms of lowering depression and stress and improving overall mental outlook. In fact, the researchers noted that people who had recently experienced stressful life events like a serious illness, death of a loved one, or unemployment had the greatest mental boost from a group nature outing. "Nature can have a powerful effect on our mental state," says Dr. Strauss, "and there are many ways to tap into it."